If a player reaps with Bulleteye and their opponent has no creatures, are they the forced to destroy one of their own creatures (if possible)? Yes. It is mandatory to resolve as much of the reap effect as possible. If there are no enemy creatures, a player must destroy a friendly flank creature. 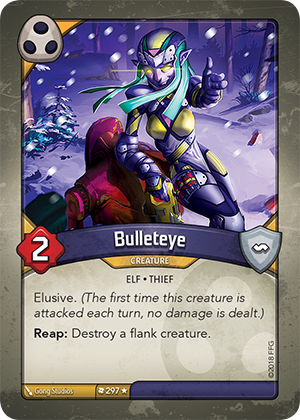 If the opponent only has one creature on their battleline, does that count as a flank creature (for the purposes of Bulleteye’s reap ability)? Yes. A single creature on a battleline counts as a flank creature.